NextPress publishes downloadable and print dialogues, essays and books by and between NextNow members and the larger social enterprise/collective intelligence communities. Express Yourself with NextPress. 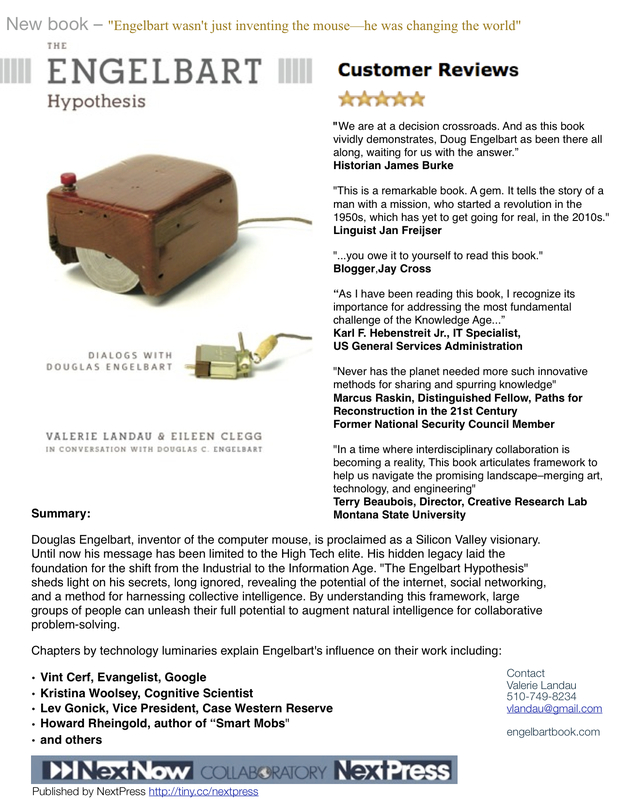 Our first effort is The Engelbart Hypothesis (Evolving Collective Intelligence) by NextNowers Valerie Landau and Eileen Clegg in conversation with Douglas C. Engelbart (December 2008). In July, 2009, we launched V2.0 at The Tech Museum of Innovation. This version integrates contributions to the authors’ thinking from the larger collective intelligence community–including Vint Cerf, Vice President and Chief Internet Evangelist at Google, and Howard Reingold, author of Smart Mobs–as edited by a panel of experts, and represents the “living” nature of the work. The ability of NextPress books to evolve as living social artifacts is key to our selection and strategy. Since social artifacts are defined as “objects or products designed and used by people to meet re-occurring needs or to solve problems,” we believe that only those that can evolve in real-time with the need or problem they intend to address are truly responsive to the larger challenge of shifting the world from systems breakdown to breakthrough, and to creating a thriving and collectively intelligent world. If you would like to engage our community through a NextPress publication, submit a comment or contact us.